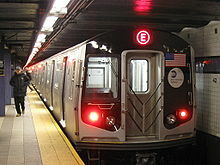 Rapid transit is a type o heich-capacity public transport generally foond in urban auries. Unlik buses an trams, rapid transit seestems operate on an exclusive richt-o-way which is uisually grade separatit in tunnels or elevatit railways. ↑ "Rapid transit". Merriam-Webster. Retrieved 2013-07-31. ↑ "Metro". International Association of Public Transport. Retrieved 2013-07-31. ↑ "Glossary of Transit Terminology" (PDF). American Public Transportation Association. Retrieved 2013-07-31. ↑ "Rapid Transit". Encyclopedia Britannica. Retrieved 2013-07-31. This page wis last eeditit on 25 Mairch 2015, at 05:54.